Leavittsburg, Ohio was where the two main Erie lines for the Warren/Youngstown area crossed. Here at SN Junction the former Atlantic & Great Western mainline (originally from Cincinnati, later extended via Marion to Chicago) to New York crossed the Cleveland & Mahoning Railroad, which connected Cleveland with the steel industry in Youngstown Ohio and joined the A&GW main in Shenango, Pennsylvania. 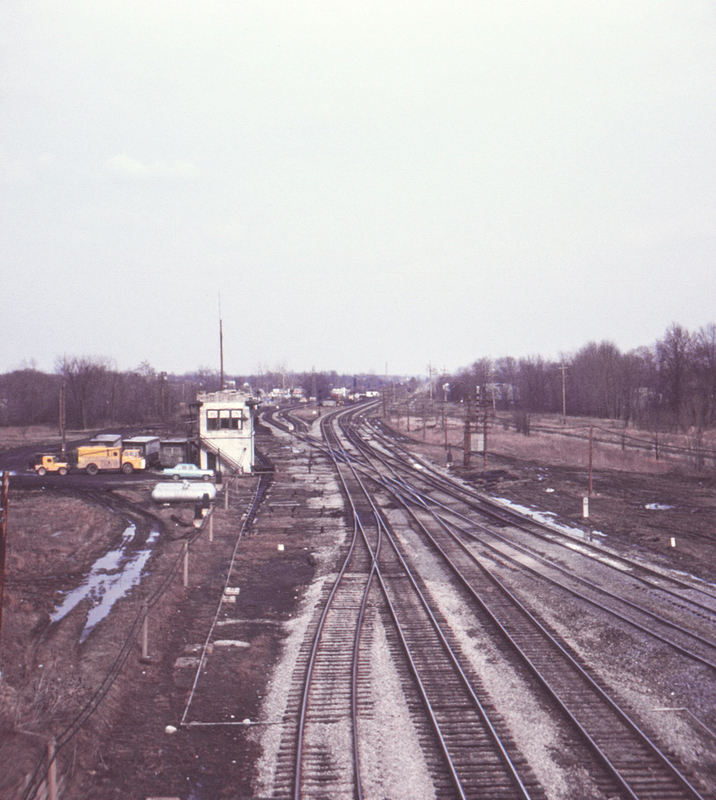 Seen looking east from the Ohio Route 5 overpass, the C&M main comes in from the middle right and passes straight through the junction on its way to Warren and Youngstown. The A&GW main is at the far right, crossing the C&M and then turning to parallel it. A short distance ahead it curves off to the left to pass through North Warren on its way to Shenango. Note the double and single slip switches (sometimes called "puzzle switches") that enabled maximum flexibility in routing trains through the junction. At the far right the B&O's Warren Branch (at one time the main line through Warren) can be seen on its way to rejoin the B&O main at Newton Falls. The track at far left is a passing siding on the C&M.. This page posted 8/1/2017. Text and photo ©2017 Lamont Downs.